The evolution of 3 Ravens continues and it's gaining quite a pace. The old core range, one that had been tweaked a little over the years but stayed pretty consistent, is on the backburner and a new "CAW" range is here. 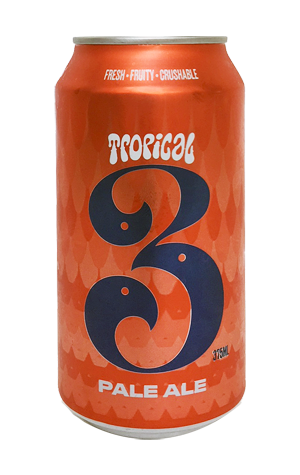 It's based around three pale and hop forward beers, each of which comes in a boldly coloured can featuring the brewery's new psychedelic stylings with the "3" shouting loud and proud from the front. The Tropical Pale Ale is a beer drinkers may have encountered on tap in the weeks leading up to the can launch, tagged as merely 3 Ravens Pale, and sits firmly in the realm of fruity 'n' sessionable. You can pick from the likes of passionfruit, papaya, melon and nectarine on the nose, while there's a pleasant pale malt sweetness keeping the hops company, backed up by a gently palate coating bitterness.